Phosphorus fertilizer does not move in the soil, which means that it needs to be placed where a plant will be able to access it. Broadcasting the immobile nutrient across the entire field doesn't make sense, because it won't move to the rows where the plants are. Phosphorus is responsible for cell division and elongation and is needed early in a plant's life in the highest quantity. Considering the lack of movement of the fertilizer and the plant's need for P early in it's life, it makes sense to apply a phosphorus starter with the planter. Seedling roots and early crown roots of some crops will take up phosphorus; thus determining the ideal placement of the fertilizer. Feeding the soil in the fall and hoping to get some of the nutrient back for the plants in the spring can be improved upon by moving some of the fall application to a planter applied band. 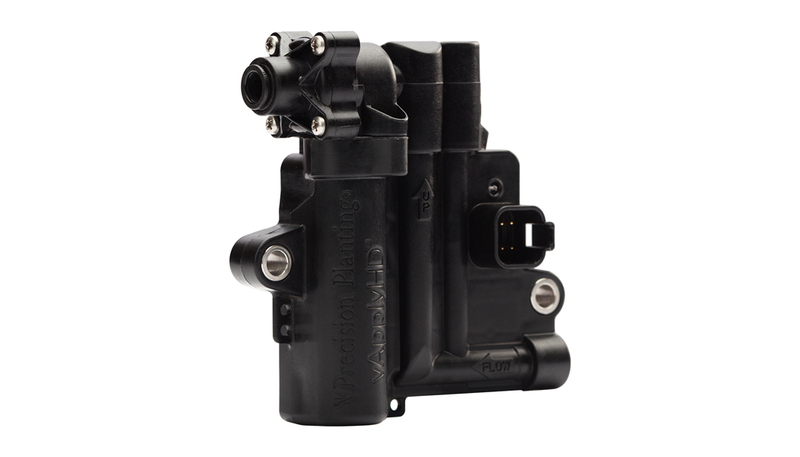 Putting starter where the plant needs it, when the plant needs it, takes FurrowJet. 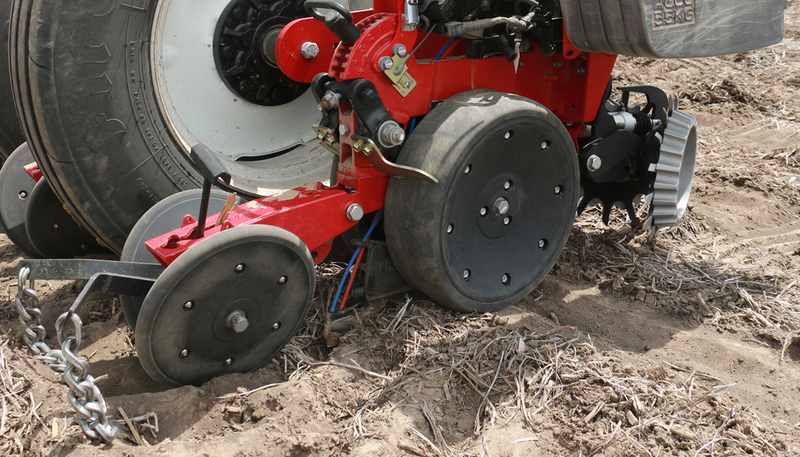 FurrowJet is a planter mounted device that places three bands of phosphorus starter fertilizer near the furrow; one in furrow, and two about 3/4" away from the seed on either side. These three bands are placed right where the seedling roots and crown roots will grow, taking up the P and thriving. Starter test plots were planted May 6 and 7 in 2016. Within 24 hours of planting, this field received excessive rainfall in a short amount of time, which played a role in the results. "The large yield responses show the effect of starter fertilizer placement and the horsepower it provides to mitigate early season stress," Ken Ferrie said. "The fact we were able to weatherproof this plot by replicating it across the field makes the large yield increases more believable." 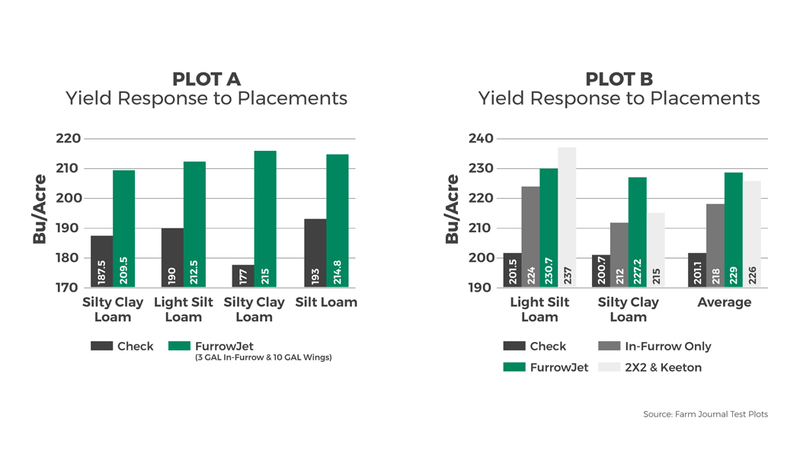 The first study was a comparison of the check to FurrowJet applying 3 gal in-furrow and 10 gal through the wings. The second study compared the check to in-furrow only, FurrowJet (tri-band) and a 2X2 with Keeton together. 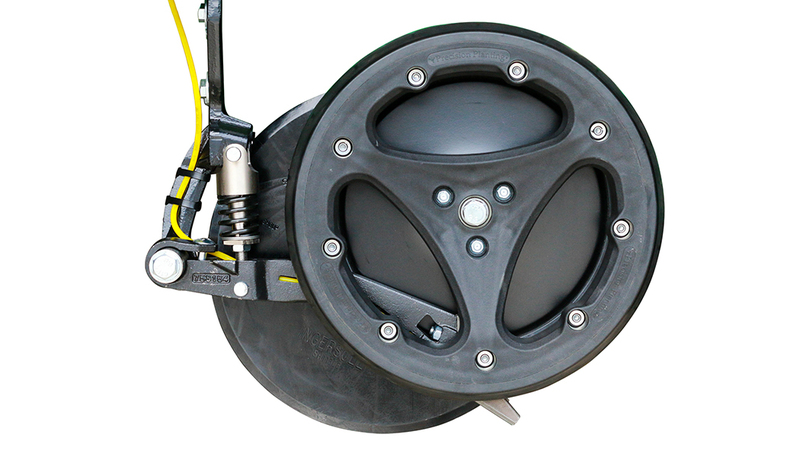 FurrowJet offers a lot of flexibility since your nutrient management plan is as unique as your fields are. 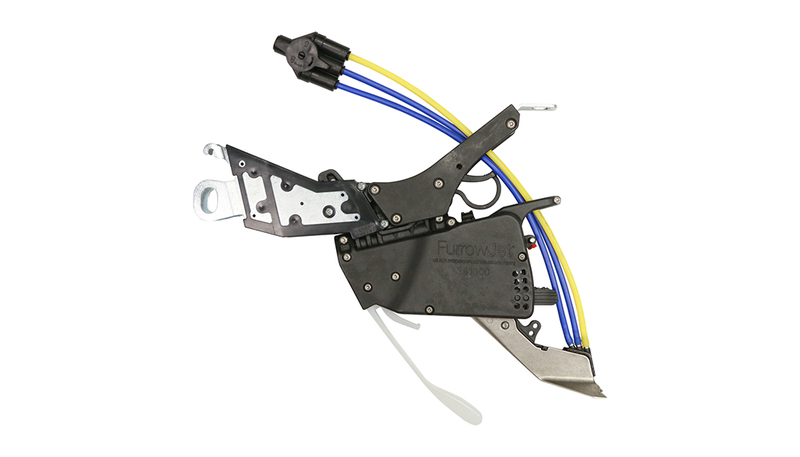 FurrowJet starts by firming the seed in the trench, and then placing the bands of fertilizer on and near the seed. Some growers have elected to run a different product in furrow and in the wings, and others have added micronutrients and only placed the fertilizer with the wings. The choice is yours, but the answer to each of these questions is FurrowJet.